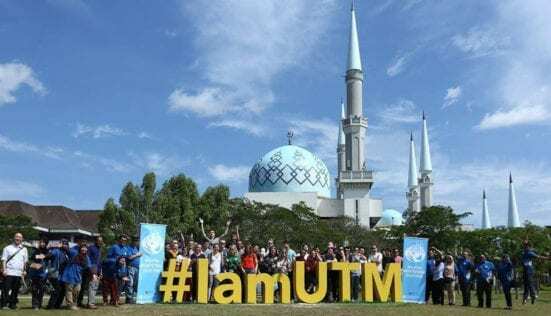 JOHOR BAHRU, 4 January 2019 – A group of 39 architectural students accompanied by two faculty members from Kansas University (KU) Lawrence, United States had visited the Faculty of Built Environment and Surveying (FABU) of Universiti Teknologi Malaysia (UTM). The visit by KU Lawrence delegation started since 2013 where the university has chosen Malaysia as one of the countries to be a case study for its Study Abroad Programme. Besides Malaysia, KU Lawrence has also chosen Singapore and Japan to visit. The Director of Malaysia Architectural Study Tour of UTM Sultan Iskandar Institute (ISI), Assoc. Prof. Dr. Gurupiah Mursib said that this study tour which took place between January 4th and 11th received an unexpected response. “According to Assoc. Prof. Dr. Kapila Silva, Head of the Study Program of Kansas University, the rapidly developing Malaysia which is rich in culture is the main reason it was selected for the study, together with Singapore, and Japan. “For this purpose, the UTM Sultan Iskandar Institute (ISI), supported by the School of Architecture, Faculty of Built Environment and Surveying, had prepared a special programme of 8 days 7 nights excursion covering Johor, Melaka, Kuala Lumpur, Putrajaya and Selangor,” said Prof. Gurupiah. He also stated that Malaysia’s architecture offers a different experience from the modern architectural era (1955-1970), through the postmodern era (1971-1990) and the global era (1991- 2017). “As the host, we have organized a program designed to provide a comprehensive overview of traditional architecture, to the award-winning iconic architecture. “Several traditional buildings were visited namely the traditional Mini Garden Malaysia houses, while the National Mosque, the Central Market, the Sultan Abdul Samad building and the Masjid Jamek represent modern early architecture,” said Prof. Gurupiah. Prof. Gurupiah later explained that the global Era are represented by skyscrapers such as the Petronas Twin Towers, Kuala Lumpur Tower, The Fennel, and the OBYU Tower. Also included are buildings with special concepts such as PAM Center, Arc Rimbayu, Bamboo Playhouse House and PJ Trade Center. “The beauty of this programme is that the program directly features architects of the selected buildings. The 2018 study has featured Ar Jimmy Lim as the highlight of the study while for this time, the program featured Dato ‘Dr Ar Ken Yeang and Ar Wooi Lok Kuang. “Ken Yeang’s architecture was represented by Menara Mesiniaga, Roof-roof House, and the Suasana Putrajaya while Wooi showcased his architecture of houses including his own home,” said Prof. Gurupiah. Prof. Gurupiah said that in the concept of urban planning, the Putrajaya Federal Government Administrative Centre represents the new and planned city development. The tours included the Putrajaya Holdings, the Sultan Mizan Mosque, Dataran Putra, the Boulevard and Putrajaya Cruise. In the meantime, DBKL efforts to create urban space have led to historical heritage in Kuala Lumpur such as the River of Life, back lanes, Lake gardens and Batu Caves. The welcoming session for the delegates was held at the Faculty of Architecture and Survey, UTM Johor Bahru campus on 4th January 2019 followed by a lunch session at Ar Razin Mahmood Denai House in Kempas, Johor Bahru. Dean of the Faculty of Architecture and Survey, Prof. Dr. Mohd. Hamdan Hj. Ahmad, Associate Director (Student Services & Global Education Experience), Prof. Dr. Nor Haniza Sarmin as well as the Executive Director of ISI were also present. A memorable farewell dinner was held the following week at Menara Kuala Lumpur. This program reflects the strong continuous ties between UTM and Kansas University, soon to be made official via MoU, Prof Dr Mohd Hamdan Ahmad, Dean of the Faculty of Architecture and Survey mentioned in his welcoming speech.